Travel to India, whether for the first or tenth time, is always a thrilling experience. Here the scenery varies from tropical beaches to huge global cities, and from Himalayan mountain scenery to magnificent Mughal architecture. Many of Explore's Indian adventure tours begin in the capital city. Our trips to Delhi typically begin with a walking tour through the narrow lanes of Old Delhi. You’ll find yourself surrounded by tiny shops selling spices and dried fruits, vegetable stalls, tailors and a chai stand selling hot, sweet tea on almost every corner. Local families come here to shop and it’s a great chance to meet people and discover the real Delhi. Drive just four hours from Delhi to the city of Agra, home to one of the world's most iconic buildings, the beautiful Taj Mahal. Built as a memorial to Shah Jahan's favourite wife Mumtaz, it took 22 years to build by a workforce of almost 20,000. Many of our trips visit the Taj Mahal where the immaculate formal gardens offer a peaceful haven, providing the perfect spot to sit, relax and take it all in. For a chance to experience India's more relaxed side, take a holiday with Explore in the south of India. Known as Gods Own Country, Kerala’s has a vast network of waterways known as the backwaters. 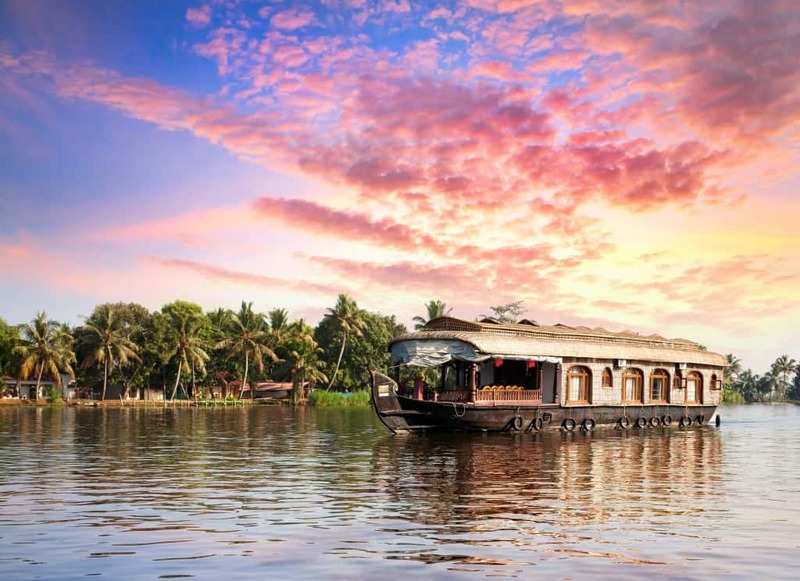 Large boats that were originally used to transport goods have now been transformed in to floating homes and our Kerala Backwaters holiday offers a chance to spend a night on a houseboat. Looking for respite in the hot summer months the British set up summer homes in the tea plantation zones of Munnar, Ooty and Darjeeling. These regions still hark back to the past with narrow gauge 'toy trains' steam trains that climb through the hills, grand colonial buildings and even golf courses! One of the best ways to explore the tea regions is on an Explore walking holiday; travelling On Foot in Kerala allows you to take your time and chat to tea pickers as you hike through beautiful landscapes. Travelling in the east and north east of India offers the chance to meet with unique tribes and visit annual festivals that few people have seen before. Central India is less well known but offers many highlights including the incredible temple complex in Hampi alongside the unique cave temples at Badami and Ajanta. India is a colourful, vibrant country and the festivals, traditions and celebrations highlight why thousands of people make trips to India each year. Travelling to India at certain times of the year can guarantee you get to join in. Holi, known as the festival of colour, celebrates the arrival of spring and good conquering evil. It begins with rituals and prayers which take place in the evening. The following morning, known as Rangwali Holi, is the time to throw coloured tika powder, spray friends and family with coloured water and spend time singing and dancing. Holi is one of the best festivals to get involved with, families are out on the streets celebrating and won't hesitate to invite you to join in - take some old clothes that you don't mind getting the tika powder on, it gets everywhere! Also celebrating the victory of good over evil is Diwali, the festival of lights. Visiting India during Diwali you'll find homes are decorated with hundreds of fairy lights and candles and coloured powders, rice and sand are used to create traditional patterns on the floor called rangoli. Diwali lasts for five days and on the final night prayers are said to Lakshmi, the Hindu goddess of prosperity, before families share a feast together. The annual Hornbill Festival in Nagaland is a unique celebration of the tribal heritage of the region. The festival is held in the first week of December each year and runs for 7 to 10 days. Each tribe has a chance to show off their dances, songs and even hunting techniques. There are displays of traditional homes and stalls offering foods from each tribe, but beware, lots of the dishes contain the very fiery Naga chilli! Every 12 years India plays host to the largest, peaceful gathering on earth, the Kumbh Mela. This festival see Hindu's come to the banks of a sacred river and bathing to cleanse a person of their sins. The celebration lasts for two months and on certain days more than 30 million people are said to bathe in the river. Visiting India for this unique festival is very special and for those interested in photography there will be endless images to capture.